All Things Balanced. Feng Shui. Victoria BC. I will inspire & motivate positive change in your life. Create balance in all aspects of your life. that puts you in the power position. Want to attract more wealth & prosperity? Many of my clients have experienced more prosperity in their life after a Feng Shui consult. Want more love and happiness? Happiness is the goal of Feng Shui. I’ve been there…Read my journey to find love and happiness. Want to sell your home quickly, easily and with less stress? Let me show you how to attract the perfect buyer. Shortly after my session with Gail, I became excited to make the changes she suggested right away. Within a few short months, my business began to flourish! Thanks Gail for your suggestions and your gift! My main intention was to improve the love quadrant of my home and I will attest, it did the trick! I would highly recommend Gail’s services to anyone who wants to improve the energy and balance in their relationships and life. Want to sell your home quickly and with less stress? 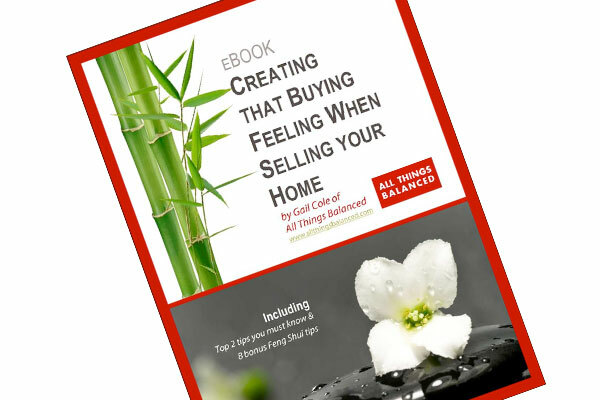 Receive my e-book “Creating that Buying Feeling When Selling Your Home” for FREE. All I need is your name and email address.